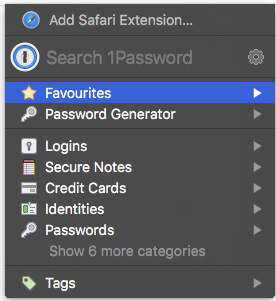 I'm running 1Password 6 (Version 6.8 (680015)), and Safari 10.1.1 (12603.2.4), on macOS Sierra (10.12.5). When I use the keyboard shortcut (⌘-\) to bring up the mini browser. Unlock with my master password, and it shows no entries. Hit ESC, then "⌘-\" and there are my options. I can lock the vault and duplicate it time and time again. I tried uninstalling and reinstalling the extension with no luck. Anyone else? It's mostly a minor inconvenience, but thought maybe others had seen it. Definitely caused a moment of panic when I thought my vault disappeared. I am seeing this too, with a slightly different set of versions (OSX is at 10.12.6 and Safari 10.1.12). On initial password fill, I get prompted for the master password, and then get this window - suggesting no extension installed. Dismiss and recall the 1PW window and its all OK again. Hi @PurdueGuyInWLA and @nigelm! Sorry about that. To get a better idea of what the issue is, could you each please create a Diagnostics Report from your Macs? Attach the Diagnostics Reports to an email, and send it to [email protected]. Please do not post your Diagnostics Report in the forums, but please do include a link to this thread in your email, along with your forum username so that we can "connect the dots" when we see your Diagnostics Report in our inbox. You should receive an automated reply from our BitBot assistant with a confirmation number. Please post that number here so we can track down the report and ensure that it is dealt with quickly. Hi @Jacob , nice name...Jacob here too! I sent the diagnostics report (#ZUN-44117-181). Mine presented the exact same dialog as @nigelm. Of course, now the problem isn't happening. I did reboot my computer this morning, so I will keep an eye on it. Perfect! I just replied to your email and we can keep the conversation going there for now. @nigelm: Thanks! I see that we've received your email, so we can continue the conversation there. We'll take a look at the diagnostics and get back to you shortly!